As I have mentioned on many of my blogs (especially Personalizemedia) virtual worlds (as 3D navigable spaces) will only really take off when there is an effective, easy to use, existing web browser implementation. We already have early entrants here such as Yoville, Vivaty, NewLively, Habbo etc: but these suffer as they are not particularly customisable or graphical true 3D. The other half way houses include Weblin, RocketOn covered in posts here. Exit Reality is another over integrated browser world, which does look much better than the above as it turns web pages into 3D space, but still not easy to use. “Imagine a business Web site where you can see what visitors are looking at and go and talk to them. Imagine a classroom with educational content like a real 3D exploding volcano and students physically located all over the world. Imagine a family or staff spread around the globe meeting up in a virtual space and being able to see each other and share photos, video and documents. The scenarios are endless with virtual worlds and until now, have been little more than pipe dreams to the average Web user,” says Vincent Teubler, co-founder of Gogofrog. I am aware of over 15 new worlds that are heading in the right direction and turning more immersive virtual worlds into social, business, educative and networking 3D windows inside browsers. One that has just press-released today is gogofrog (co-founder comes from Melbourne), with a tagline ‘Virtual Simplicity’. Its heart is in the right place and with 30 000 already using it might quickly become a dominant new player? 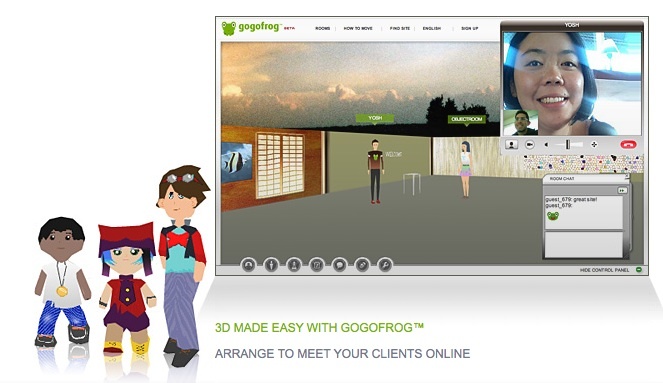 Gogofrog is breaking with convention to offer a new type of web experience. The basic idea is that you create your own 3D space (pad) that you can decorate the way you want and to reflect your personal style. In Gogofrog you can move from pad to pad discovering sites created by others and chat with people you meet along the way. You can also create your own place where you can invite your family and friends to visit and hang out. It still has a few lessons for learn from the demise of Google Lively, but several area addressed already. Keen to know how it connects the ‘pads’ properly (vs non-linked rooms) and how easy the customisation (vs importing jpeg images) tools for the 3D elements are. The full press release gives a lot more information and shows how they are across the need for personalization and integrating existing social tools inside the environment (especially video conferencing etc) – this service and the others just about to peek out are definitely worth watching. Just before the release here is a slightly reversioned Gartner Cycle showing how browser worlds are going to have more significance over the next two years. Los Angeles, California (PRWEB) February 10, 2009 — The power of virtual worlds as a means of advanced social networks, sophisticated business tools and education tools is now accessible to all Web users with the commercial launch of Gogofrog. Two years after its Beta launch, Gogofrog has taken the advice and input of its global user base of more than 30,000 to remove the prime impediments to making virtual worlds a mainstream Internet tool, access. Fully browser-based, Gogofrog enables anyone with an Internet connection to set up their own world: simple worlds for free and complex worlds for as little as a $10US monthly subscription. No software at all for Users or Visitors to download. Teubler was an early convert to virtual worlds and envisaged the power of worlds beyond the traditional realms of fantasy game play. These worlds traditionally require users to download software and usually participate in a single often poorly regulated world. Whilst businesses, educators and users of social networks saw the potential, Teubler believes the need to download software, poor security and costs associated with participating and developing content or real estate have all contributed to severely limiting the broader use of virtual worlds. Among other enhancements, the commercial launch of Gogofrog includes greater communications tools. “Anonymous text chat lends itself to fantasy game play but not much else. Our users demanded real-world communication, so we enabled avatar-to-avatar controlled webcam communication. It doesn’t get any better than that. You can request and start a webcam chat with anyone in your virtual Web space — friend, family, colleague or visitor,” Teubler says. Gogofrog also features a variety of user-defined security measures. The capacity to communicate via webcam is a big security bonus not found in other virtual worlds, as an avatar’s profile can easily be matched against them with a simple webcam chat. Gogofrog further allows users to set who they will allow in their world. With the click of a button, users can set it so only people they know — friends, family, students or staff — can enter their world, or they can set it so only those who know a password can enter. Teubler says the latter was especially important to educators who wanted to ensure their students would have a completely safe virtual experience. Gogofrog also found participation is crucial to users, so the commercial site enables users to participate in the world’s economy. 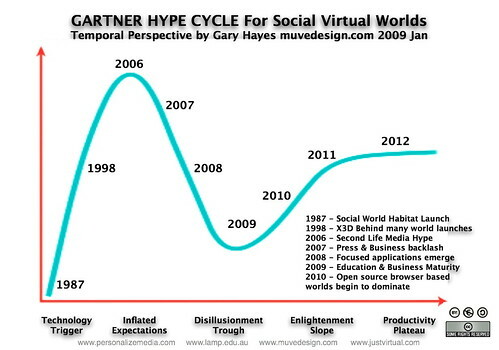 With user feedback continuing to be incorporated into Gogofrog’s software development roadmap, Teubler believes his prediction of virtual worlds becoming a highly sophisticated, commercial and entertaining part of social networks and the mainstream Internet is fast becoming a “virtual” reality. For more information about Gogofrog, visit www.gogofrog.com.